Gunnison’s Prairie Dog Population Assessments /Hawks Aloft Inc.
Prairie dogs are considered a keystone species throughout the United States. These small herbivores build essential habitat for other species and provide a valuable food source for a wide range of predators, including raptors. Burrowing Owl populations depend on the prairie dog’s extensive network of tunnels, from which the owls build their own dens and other birds; while other birds, like the Ferruginous Hawk, depend on the mammals for food. Yet, in the 100 years, there has been a significant decline in prairie dog populations throughout the nation—a fact that may have had, and may continue to have, a significant impact on the prairie ecosystems. 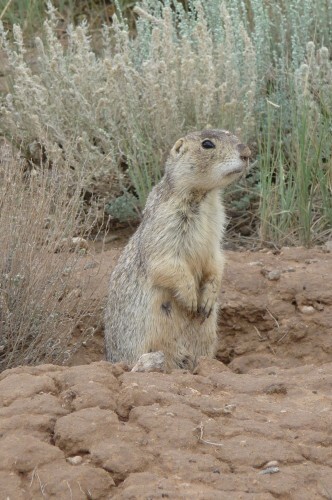 In order to gauge populations of the Gunnison’s prairie dog, a subspecies with a limited range that is experiencing local declines, Hawks Aloft first performed aerial surveys to determine locations of local colonies, and then conducted ground truthing to determine each colony’s status. Long-term monitoring is necessary to determine the status of this species, providing it to land managers who can undertake federal protection if necessary. The population of this species has far reaching impacts on other species and is a strong indicator of the overall health of the shrub-steppe, grassland ecosystem.